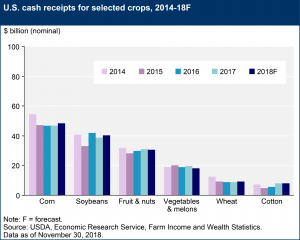 Net farm income, a broad measure of profits, is forecast to decrease $9.1 billion (12.1 percent) from 2017 to $66.3 billion in 2018, after increasing $13.8 billion (22.5 percent) in 2017. Net cash farm income is forecast to decrease $8.5 billion (8.4 percent) to $93.4 billion. 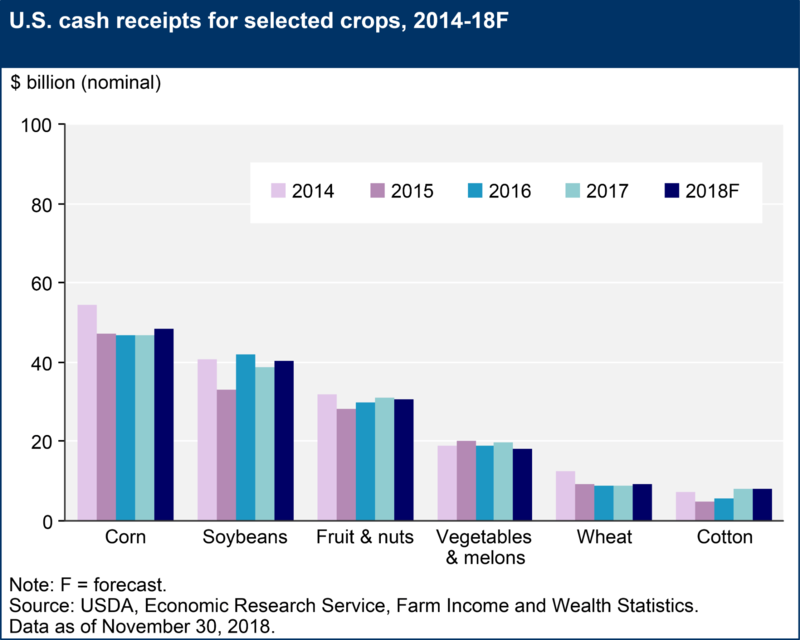 In inflation-adjusted 2018 dollars, net farm income is forecast to decline $10.8 billion (14.1 percent) from 2017 after increasing $13.0 billion (20.2 percent) in 2017. If realized, inflation-adjusted net farm income would be 3.3 percent above its level in 2016, which was its lowest level since 2002. See a summary of the forecasts in the table U.S. farm sector financial indicators, 2011-2018F, or see all data tables on farm income and wealth statistics. Due to the cool and wet conditions, soybeans harvested at this time of the year will need to be dried on the farm or at the elevator. 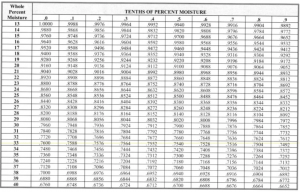 Some elevators will accept soybeans up to 18 percent moisture while others will reject loads that are above 15 percent moisture. Contact your elevator prior to delivery and understand their discount schedule. 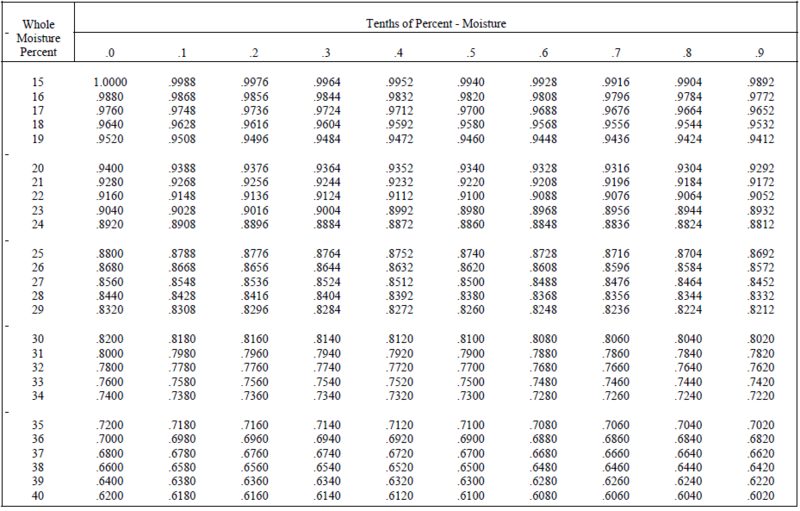 Information on understanding soybean discount schedules is available in “Understanding soybean discount schedules” from Michigan State University Extension. 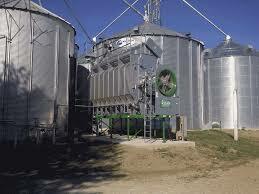 Commodity soybeans used for domestic crush or export can be dried using supplemental heat. However, food grade and seed beans should not be dried with supplemental heat. 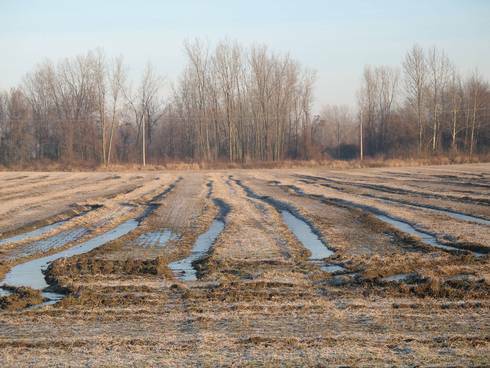 Proper management is essential to minimizing damage when using supplemental heat. Keep the drying temperature below 120 degrees Fahrenheit. Every elevator that receives soybeans has a discount schedule. Discount schedules are important because they communicate how and when various shrink factors and discounts are applied at delivery. Discount schedules vary from elevator to elevator and can be somewhat confusing. This article lists and explains the major shrink and discount factors pertaining to soybeans and provides examples of shrink and discount calculations. 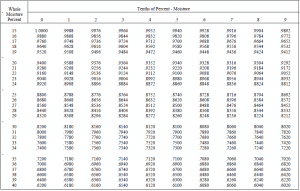 Test weight is a measure of density (mass/volume) and is measured in pounds per bushel. The standard test weight of 60 pounds per bushel is always used to convert the scale weight of soybean loads to the number of bushels contained in the load. This is true even if the actual test weight of the load is lower than 60 pounds per bushel. Therefore, test weight does not impact the number of saleable bushels harvested from a defined area (acre or field). However, most grain buyers will begin discounting soybean loads when the test weight falls below 54 pounds per bushel. Discounts are applied to the gross weight of the load before shrink factors are applied. The only advantage of having test weights higher than 54 pounds per bushel is that the beans will take up less volume in storage and during transportation. 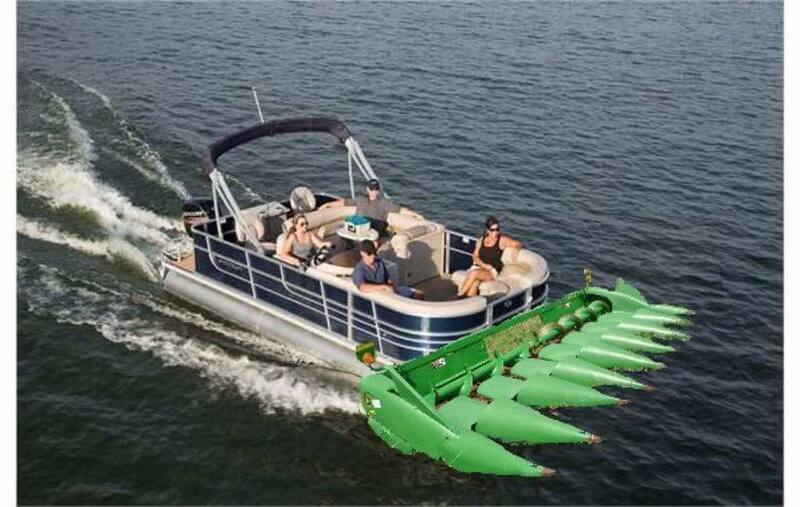 OK, While many of us feel that this picture represents how harvest has gone so far, we are not really that far behind. 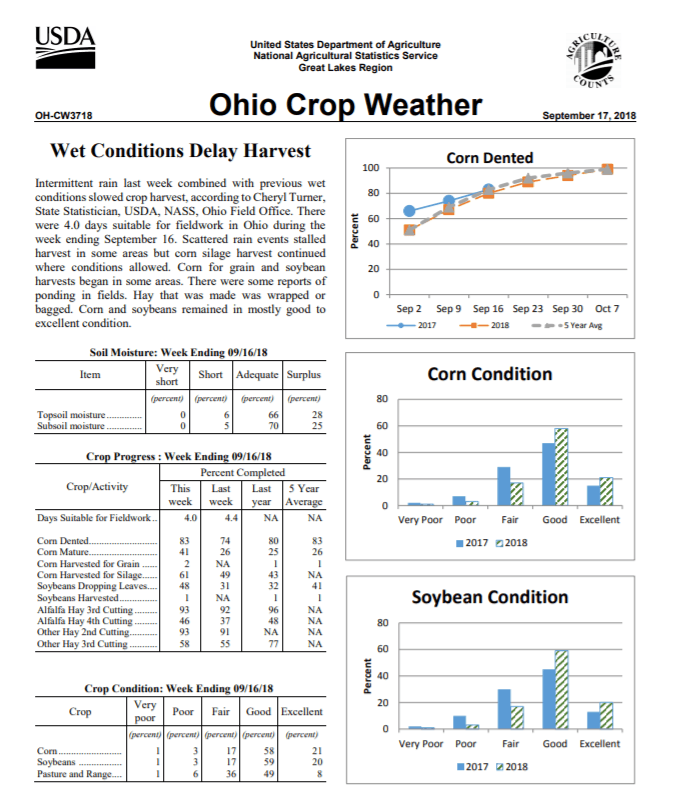 The most recent Ohio Crop Weather report issued on October 9 shows corn harvest at 21%. At this time last year we had harvested 12% of our corn while the most recent 5-year average is 17%. 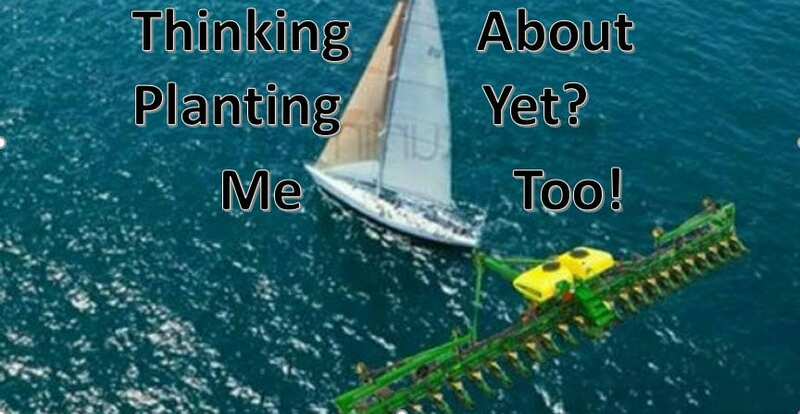 Soybeans are lagging behind just a bit. 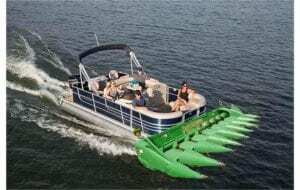 This report shows Ohio bean harvest at 30%. This compares to 42% last year and a 5-year average of 36%. So why do we feel we are so far behind? Probably because we started sooner this year and have received just enough rain to prevent us from running beans many days this year. Early reports that I am hearing have soybean yields much better than last year and good corn yields as well. See the full report below. The Moisture content of grain denotes the quantity of water per unit weight of grain. 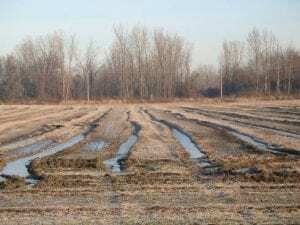 Shrinkage occurs whenever wet grain is dried. As grain is dried, moisture is removed from the grain by evaporation, which results in a loss of volume (fewer bushels) and a weight loss (fewer pounds) of grain. 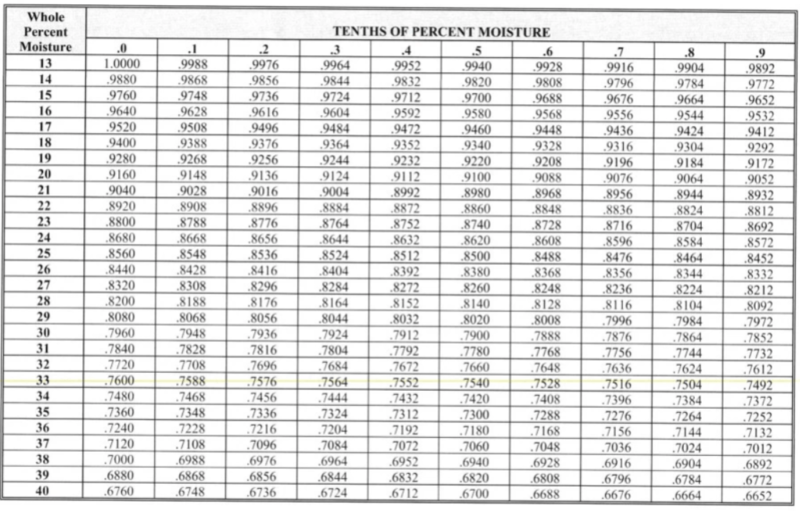 The following tables can help you determine grain shrinkage from harvest moisture to dry moisture. On August 30, 2018, the U.S. Department of Agriculture (USDA) announced its Trade Mitigation Package in response to unjustified retaliation surrounding the U.S. agricultural industry. The Trump administration chose to employ a safeguard for America’s producers who have been negatively impacted. 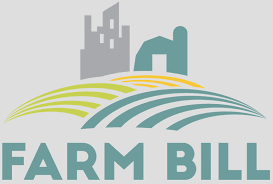 Thus, implementing a 3-pronged program that offers up to $12 billion to help subsidize farmers and stimulate the agricultural economy as a result of lost export sales, diminishing markets, and lower commodity prices. 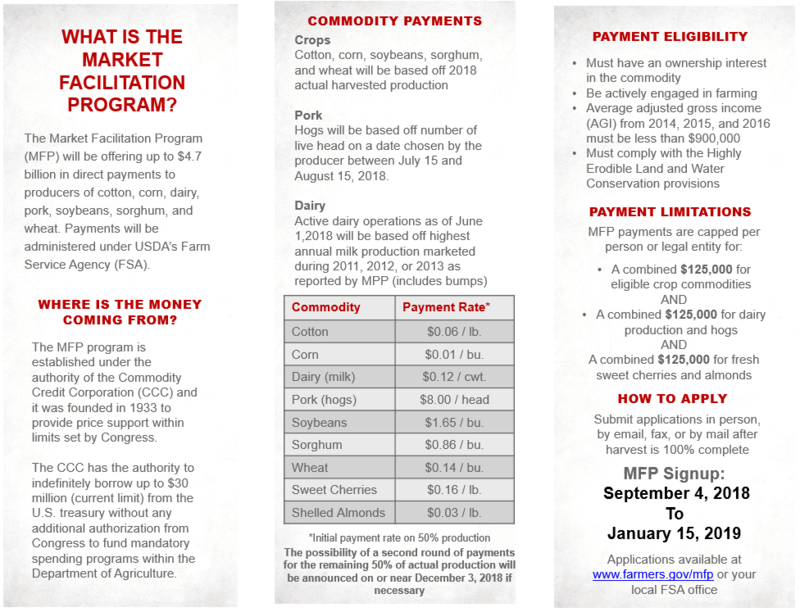 The short-term package is broken down into three parts, including the Market Facilitation Program (MFP), the Food Purchase and Distribution Program, and the Agricultural Trade Promotion Program. The warmer pattern will continue at least into the start of October across Ohio. The remnants of Florence went mainly east of Ohio with only light rainfall amounts. Temperatures will heat back up into the 80’s for much of the rest of this week. Normal highs are in the 70’s and lows in the 50’s. We expect highs this week mostly in the 80’s and lows in the 60 to near 70. The next rainfall system will move across the region later Friday or this weekend. Another system will move through by the middle or the end of next week. Overall, we expect rain systems every 3-7 days until further notice. There will be dry periods mixed in as well so this will not be a continuous wet period by any means. 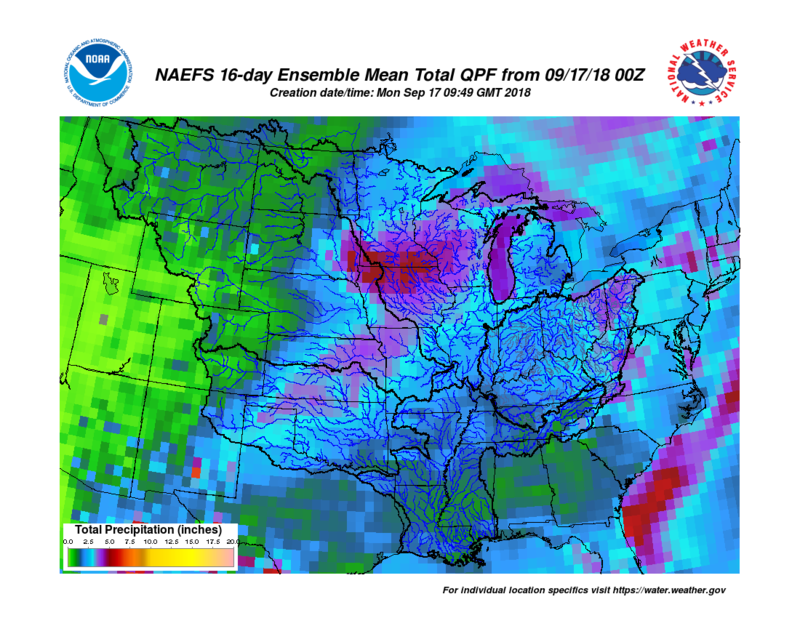 The wetter pattern may cause some delays in the fields over the next 30-60 days so it will be important to take advantage of those dry stretches. The first freeze is nowhere to be seen. We expect a normal first freeze in the October 10-20 range for most places. Over the next two weeks, rainfall will average 1-3 inches with isolated 4+. 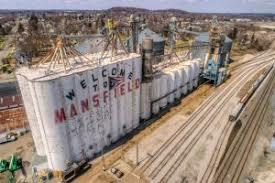 First – before using any product to treat grain bins, always read the most current label for the product to assure that the product is used correctly. 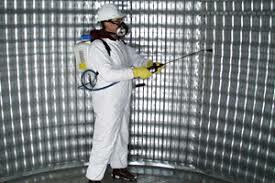 This is for the protection of the grain to be stored in the bin as well as for the protection of the applicator of the product. Labels for products are subject to change from one year to the next, product registrations can be changed and/or canceled and rates may be changed. Errors made because of not reading the most current label could result in injury to the applicator or contamination of the grain with a non-labeled product making it unsalable. Ohio’s corn yield is forecast at 188 bushels per acre, up 11 bushels from 2017 and up 8 bushels from the August forecast. If realized this would be a new record yield. Total production is forecast at 622.3 million bushels, up 12 percent from a year ago. Soybean yield in Ohio is forecast at 58 bushels per acre, up 8.5 bushels from last year and up 2 bushels from last month. If realized this would be a record yield. Total production is forecast at 286.5 million bushels. Nationally, corn production is forecast at 14.8 billion bushels, up 2 percent from August and up 2 percent from last year. Based on conditions as of September 1, yields are expected to average 181.3 bushels per acre, up 2.9 bushels from the August forecast and up 4.7 bushels from 2017. If realized, this will be the highest yield on record for the United States. Area harvested for grain is forecast at 81.8 million acres, unchanged from the August forecast, but down 1 percent from 2017. U.S. soybean production is forecast at a record 4.69 billion bushels, up 2 percent from August and up 7 percent from last year. Based on September 1 conditions, yields are expected to average a record high 52.8 bushels per acre, up 1.2 bushels from last month and up 3.7 bushels from last year. Area for harvest in the United States is forecast at 88.9 million acres, unchanged from August but down 1 percent from 2017.